(a) The social interaction scheme encompasses the role CSOs play within a research project. The role can be limited, balanced or dominant in relation to their role within the consortium. 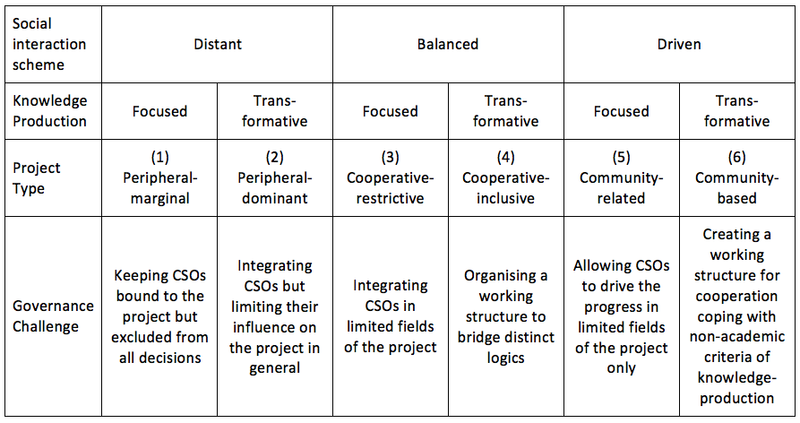 By combining both dimensions we can distinguish six different project types ranging from a project where the CSOs’ roles are limited and their importance for the knowledge production is quite narrow (peripheral-marginal) to a project where the CSOs' roles inside the project is dominant and their participation in the project significantly changes the methods and outcomes of the project (community-based). In each of the six project types specific governance challenges emerge. During our empirical research we investigated typical problems and solution strategies as evidenced within our case studies. The following guidelines thus arise as general actions designed to prevent the most common difficulties within research programmes that incorporate civil society. These general guidelines are relevant to all stakeholders within a project, whether a civil society representative, researcher, policymaker, funder, evaluator or so on (though also see our guidelines for specific stakeholders). The first step is to recognise which of the above types of project best fits the proposed research and then to apply the appropriate recommendation outlined below.